Regulate the amount of gas that is being used to heat your home, as well as the amount of money you're spending to pay for it, with this sturdy gas regulator. The natural gas regulator measures 1/2" x 1/2" and is set at 5.5" W.C. and can adjust from settings between 4-8 to meet your specific taste. No one likes to spend money unnecessarily, so make sure you can regulate how much gas your home is generating with this useful regulator. That regulator is threaded for 1/2 inch pipe on both sides. Sir I have a new direct vent Williams dual sided 50k btu wall heater I have installed and the manual calls for a max of 7" W.C / min 5" W.C.. I have to further lower to 4.0" on the output side of the furnace valve. My city gas inlet reads 10.5" to about 13" W.C... The gas company said they would lower it for me but then the rest of my gas appliances would not work. We agreed a gas regulator for this one appliance was the way to solve that problem. My question is would this regulator be safe to install inside near or below the burner system where the main furnace valve is located? It does not get hot in this area. It's down low between studs of the wall but not closed in to allow gas buildup. I need 1/2 NPT on both ends. Could you recommend the proper regulator for this furnace installation that I could order? Thank you. That would be the correct regulator and would work fine in that application. Hi - can this regulator be placed inside the fireplace? I'm assuming I'd place this in between the flex pipe which runs to my H burner and the wall gas pipe, if so, correct? Thanks. This can indeed be set in the fireplace. My current regulator is set at 4.5 but has broken and leaks gas. If I buy this how do I adjust it down to the 4.5 wc that my gas log set needs? Adjustment is done by turning the adjustment screw under the seal cap to turn the pressure up or down, and measuring the resulting gas pressure using a manometer at the valve for the gas log set. As you can't test the pressure directly at the 670 regulator, I would turn the pressure on the regulator all the way down when attaching to your log set, and then gradually raising the pressure until the reading is at 4.5 WC. I bought a vent free natural gas wall mounted heater and need a pressure reducer regulator. Will this work? You will need to consult with your installer or plumber regarding how much your pressure needs to be reduced and whether or not this will work for your application. Can the Maxitrol Natural Gas Regulator #670 being used for an outside gas log set up, or only used indoors? 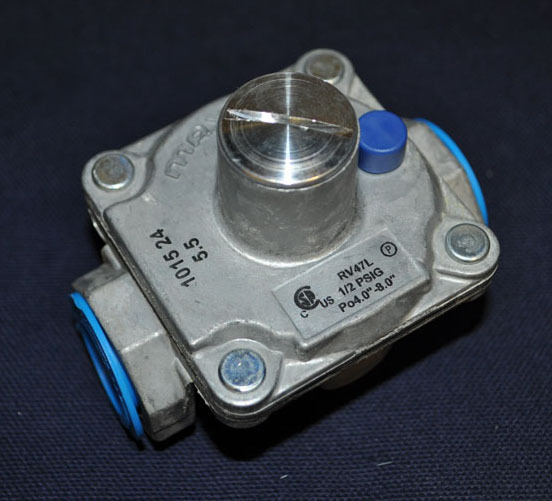 The Hearth Products Controls 150,000 BTU Pressure Regulator would be a much better option. Will this gas regulator work for any natural gas fireplace? This regulator will work with any natural gas fireplace that requires an incoming pressure rating between 4 to 8 inches of water column. The regulator can be adjusted for fine tuning of the output pressure. Can this regulator be installed inside the firebox at the back of a natural gas log set? It is indeed possible to install this regulator within the firebox, as long as it is located as far as possible from direct flame. It is best to use a flex line or appropriate rigid fittings to ensure the regulator is as far in the back corner as space allows. The correct gas regulator, delivered fast. After receiving my new Williams Direct Vent Heater, I found that I could not locate the correct in-line regulator. The pressure is critical. Even the "contractor/pro" plumbing shops couldn't help. Not only did eFireplace Store have the correct regulator, it was delivered within a few days. Ahhh! Nice, warm garage. My flame was way too high on a log set, the currently installed flame is perfect.